Widely recognised as one of the greatest all-round racing drivers in the history of motorsport, Johnny Hebert is among an exclusive club of British drivers to have enjoyed a successful career in Formula 1. Johnny began his racing career in 1974 racing karts at the age of 10, and by 1978 he was British Junior Karting Champion. Progressing through the ranks, he was British Senior 135cc Karting Champion in 1979 and then in 1982, reaching 18th in the World Championships at Kalmar, Sweden, the same year. Moving up to Formula Ford at the end of 1983, Johnny completed two full years in the highly competitive series with a triumphant display at the 1985 Formula Ford Festival at Brands Hatch. Here he carved out a place for himself as one of Britain’s fastest rising stars. 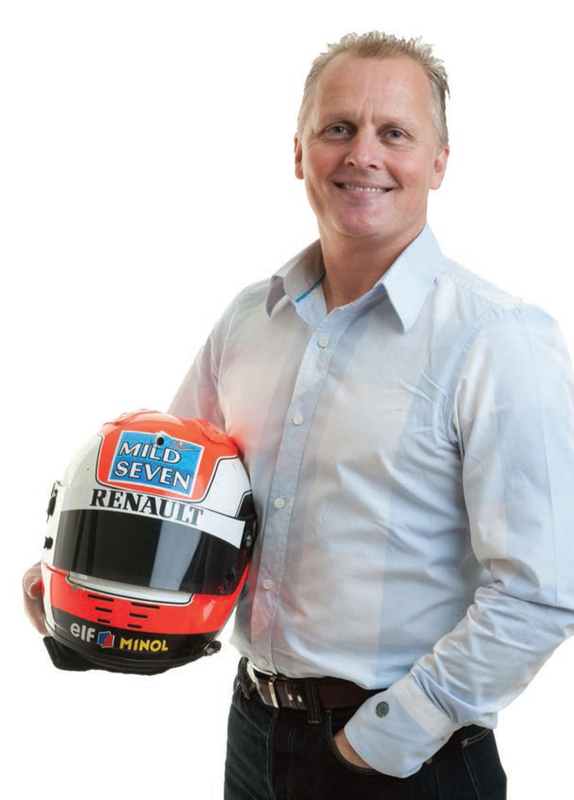 He took another step up the ladder in 1986, graduating to FF2000 where he achieved one victory before moving to Formula 3 later that year. After a successful Formula 3 debut with the Mike Rowe team, Johnny’s speed and skill were attracting attention and Eddie Jordan was quick to snap him up for the 1987 season, saying he had “an absolutely brilliant natural talent.” It was a triumphant year and with five race wins and a championship under their belts, Johnny and the Jordan team were able to move up to Formula 3000 for the 1988 season. Winning on his debut at Jerez, Johnny’s Formula 3000 career was off to a flying start but as he fought to stay in contention to win the Championship at Brands Hatch, a horrifying mass pile-up threatened to end his career. As his Jordan car hurtled off the track and into the barriers the extent of his injuries were initially unclear; he was soon told that he had suffered serious injuries to both his feet and ankles. Despite being told by Doctors that he would never walk again, it was a huge act of bravery that saw Johnny make his comeback to motor racing in 1989 with Formula 1 team Benetton. Returning to the track just seven months after his accident and barely able to walk, Johnny made his debut in Brazil. He finished an astonishing fourth and picked up his first Championship points of the season. However, his injuries continued to plague him and he was dropped by Benetton mid-season after failing to qualify for the Canadian Grand Prix. Taking the opportunity to make a full physical recovery, Johnny worked on his fitness and after a brief spell at the Japanese series of Formula 3000 returned to Formula 1, first with Tyrrell and then Lotus. Johnny’s next challenge would see him move to the Ligier Formula 1 team in mid 1994, before returning to Benetton full-time. It was here he undoubtedly found the form of his career. 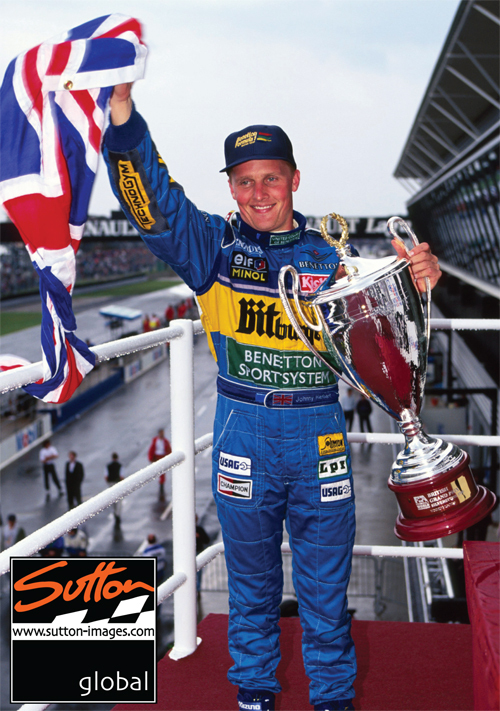 Racing alongside his driving partner Michael Schumacher, Johnny had a disappointing first season, but his first ever Formula 1 victory at the British Grand Prix in 1995 won the adoration of the British public and he soon became a national hero. His success continued in the sport as he went on to achieve further Grand Prix victories, including first place at the Italian Grand Prix and third in Japan. Finishing the Championship in fourth place, this was to be Johnny’s finest year in Formula 1. He worked tirelessly alongside Michael Schumacher to secure the Constructors Championship, adding 45 points to their total of 137. After his success at Benetton, Johnny joined Swiss-based Formula 1 team Sauber, enjoying three successful years where he secured two podium places and helped the team establish themselves in the Grand Prix arena. In 1999, a new challenge beckoned and Johnny joined a younger team mate by the name of Rubens Barrichello at Stewart. It was with Jackie Stewart’s Formula 1 team that Johnny secured the last of his Grand Prix victories at the Nurburgring in Germany. In an incredible career, Johnny has survived over a decade of ups and downs in Formula 1, testing himself against some true greats: Michael Schumacher, Damon Hill, Ayrton Senna and Nigel Mansell to name but a few. To date he remains one of the most popular personalities in the paddock. Although famous for his time on the Grand Prix circuit, Johnny has competed in many different forms of motorsport. He is well remembered for his success at the Le Mans 24 hour race, a title that he secured for the first time in 1991 alongside Bertrand Gachot and Volker Weidler. More than a decade later, Johnny returned to the whirlwind of 24 hour racing at Le Mans and in 2004, alongside teammate Jamie Davies, won the Le Mans Series Championship at the wheel of the dynamic Audi R8. He also became a front runner in the American Le Mans Series (ALMS) winning several races and putting up a strong fight to win the title. In 2005, Johnny was appointed to the post of Sporting Relations Manager at Jordan Grand Prix, which was later renamed Midland F1 for the 2006 World Championship, however in September of the same year; Spyker Cars bought the team, renaming it Spyker MF1 and ending Johnny’s contract. Back behind the wheel again, Johnny entered the 2007 Le Mans 24 hours, helping the Aston martin team to a top ten finish. Then, in 2008, at the age of 43, he won the first season of the Speedcar Series before turning his attention to The British Touring Car Championship in 2009, where he raced for Team Dynamics in a front-wheel drive Honda Civic. 2010 and Johnny was back on the top step of the podium in the Superstars International Series, driving a Chevrolet Lumina to victory at Kyalami. More recently, Johnny secured a position as an advisor to Formula 1 race stewards at several 2011 Grand Prix races.